Therapeutic solutions. Helps boost circulation. Energises mind and body. Helps to eliminates toxins. Recharge + stimulate with black pepper.The waters of the Dead Sea have been renowned for their therapeutic effects since ancient times. They are unique - with a salt concentration 10 times higher than ocean water and containing the highest concentration of natural minerals in the world - vital for maintaining healthy skin. 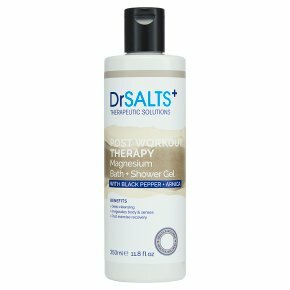 Dr Salts+ have combined 100% natural Dead Sea Salts with an organic extract of reviving Black Pepper and an invigorating blend of Basil extract, Aloe Vera, Tea Tree Oil and Peppermint for the ultimate daily boost. This stimulating combination aids detoxification and leaves skin feeling refreshed and rejuvenated. Bring the therapeutic benefits of the Dead Sea into your own bathroom! Key Ingredients and benefits: Dead Sea Salts contain 21 different types of minerals including Magnesium, Potassium, Sodium and Calcium, essential for staying healthy. Organic Black Pepper contains antioxidants and anti-bacterial skin stimulating properties to help eliminate toxins. Aloe Vera is known to moisturise and soothe the skin to prevent it from drying out. Tea Tree Oil is well-known for its powerful antiseptic properties and ability to boost the skin's healing process. Directions: In the shower, lather up and massage across damp skin or in the bath, pour a generous amount under running water; lie back and enjoy your soak. For external use only. Avoid contact with eyes. Should this occur rinse immediately with water.